Our Annual General Meeting is this Sunday, 31 May, at 2.30pm in the Corn Exchange in Melrose, (Map) however, as is usual, we'll have a talk too. 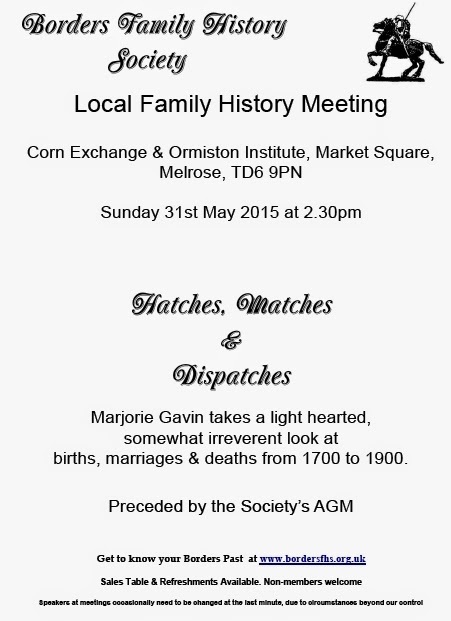 This Sunday's talk is by Marjorie Gavin. She's held a number of roles in the Society over the years, including Chairman and Magazine Editor. She has contributed to lots of publications and has extracted notices of births, marriages and deaths, both home and abroad, from several local papers over the years, often adding bits of extra information like details of other family members or biographical notes, and these appeared in lots of our magazines from about 1997 onwards. 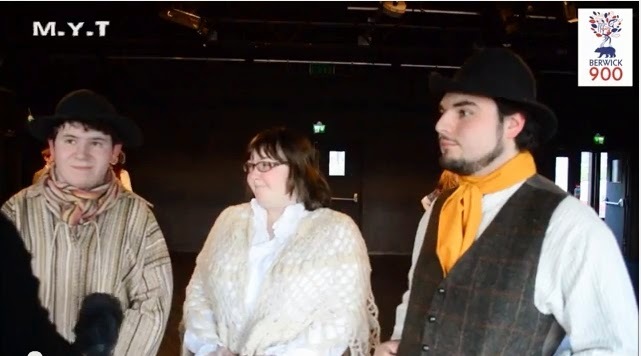 Her talk is titled ‘Hatches, Matches and Dispatches’ and perhaps to counteract the formality of the Annual General Meeting, she says it’s a light-hearted and somewhat irreverent look at births, marriages and deaths from 1700 to 1900. I’m sure you'll find this a very interesting talk. Doors open at 2pm; the AGM begins at 2.30pm and the talk after the AGM, perhaps about 2.45pm. This is the last talk before the summer; the subsequent talk (the first one of the 2015/2016 syllabus) will be on 27th September.